This week’s Highlands NC real estate spotlight is on a Chestnut Cove condo that is currently listed for sale. 261 Chestnut Cove, Unit 10-A is an impeccably maintained 3 bedroom 3 bedroom, 3 bath condo in the Chestnut Cove section of Highlands Falls Country Club. This condo is a must-see for the buyer looking for country club living and low maintenance ownership at the same time. 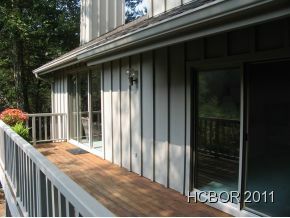 This lovely Highlands NC condo has a great golf course view and a large deck offering plenty of privacy. The sun room is a wonderful spot in which to enjoy a book or time with family and friends. There is a small extra room upstairs which has proven to be great for the kids. Highlands Falls Country Club is a wonderful golf and tennis community in a stunning setting. Membership to the club and its facilities is optional. Contact me, Lynn Kimball, today to schedule a private showing of 261 Chestnut Cove, Unit 10-A, or any other Highlands property currently listed for sale. I welcome the opportunity to be your Highlands real estate guide. Let my knowledge and experience help you locate a home that suits your needs and lifestyle, realizing your dream of owning a vacation home in Highlands NC.